Exploring how design can be used for good?prompting self-reflection, igniting the imagination, and affecting positive social change. Good design provides solutions to problems. It improves our buildings, medical equipment, clothing, and kitchen utensils, among other objects. But what if design could also improve societal problems by prompting positive ideological change? 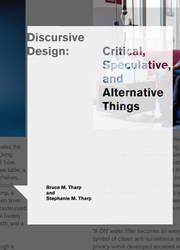 In this book, Bruce and Stephanie Tharp survey recent critical design practices and propose a new, more inclusive field of socially minded practice: discursive design. While many consider good design to be unobtrusive, intuitive, invisible, and undemanding intellectually, discursive design instead targets the intellect, prompting self-reflection and igniting the imagination. Discursive design (derived from ?discourse?) expands the boundaries of how we can use design?how objects are, in effect, good(s) for thinking. Discursive Design invites us to see objects in a new light, to understand more than their basic form and utility. Beyond the different foci of critical design, speculative design, design fiction, interrogative design, and adversarial design, Bruce and Stephanie Tharp establish a more comprehensive, unifying vision as well as innovative methods. They not only offer social criticism but also explore how objects can, for example, be used by counselors in therapy sessions, by town councils to facilitate a pre-vote discussions, by activists seeking engagement, and by institutions and industry to better understand the values, beliefs, and attitudes of those whom they serve. Discursive design sparks new ways of thinking, and it is only through new thinking that our sociocultural futures can change.